A very nice lady comes into my Starbucks almost every morning. We've made small talk a few times. 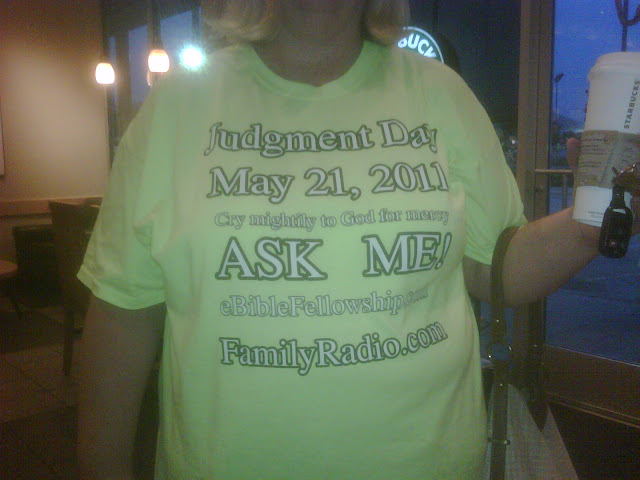 Yeah, she's one of theTrue Believers who thinks that Judgement Day will be tomorrow. I asked her about any possible backup plans, just in case God/Jesus/Spirit didn't descend on Jerusalem and start holding court. She said that they don't even think about that possibility, since that would be "doubting God, and doubting God's word." 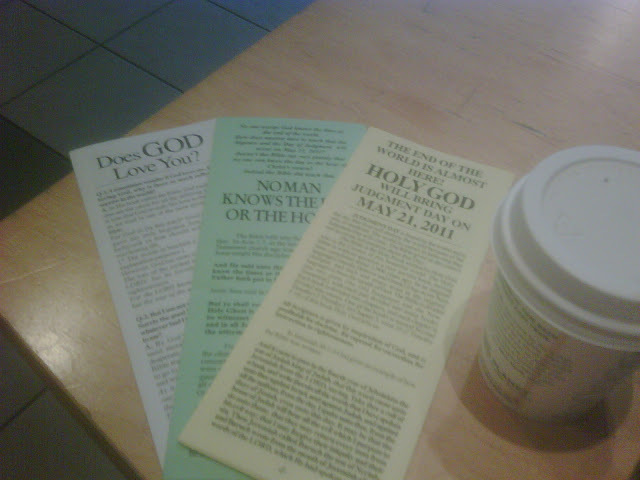 She left me with some helpful tracts. I've scraped the main page from their website, mostly because you lazy folks NEVER hit links. Don't bother reading it. Just get the general flow of the thing. I can promise you this.... When the world doesn't end tomorrow, the Family Radio scaremongers will remain in business. They'll drop back and punt to a later date. The donations will continue to flow. Just like the Global Warmists will continue trying to panic the populace when the glaciers haven't melted in 2013. Just like the Warmongers kept banging the drum for more invasions after we didn't find WMD's in Iraq. Just like the early church kept going after the disappointment of not having Christ return within their lifetimes. Just like we keep pumping money into so many things, rather than admit we need to start over. Here's the site. Sorry for the lack of formatting. If all of you readers are taken up into the sky, and I'm left behind to take care of the dachshunds, I'm going to spend my free time improving my HTML skills. the words are closed up and sealed till the time of the end. fro, and knowledge shall be increased. history is completely accurate and trustworthy. sons and their wives survived in the ark (6023 years from creation). church age began (11,045 years from creation; 5023 calendar years from the flood). save a great multitude of people outside of the churches (13,006 years from creation). will be destroyed by fire (7000 years from the flood; 13,023 years from creation). substance that I have made will I destroy from off the face of the earth. years into the future from 4990 BC, we find that it falls on the year 2011 AD. but he revealeth his secret unto his servants the prophets. righteousness which is by faith. from the flood. We also know that God will destroy this world in that year. But when in 2011 will this occur? and female of all flesh, as God had commanded him: and the LORD shut him in. up the ark, and it was lift up above the earth. end in the year 1988 AD. It so happens that the church age began on the day of Pentecost (May 22nd) in the year 33 AD. Then 1955 years later, the church age came to its conclusion on May 21st, which was the day before Pentecost in 1988. 7000 years from the flood. 7000 years from the flood of Noah’s day. ark. Through this and much other Biblical information, we find that May 21 st, 2011 will be the day when God takes up into heaven His elect people. man enter in, he shall be saved, and shall go in and out, and find pasture. heaven. He is the only portal into the glorious kingdom of heaven. the air: and so shall we ever be with the Lord. as the earth will no longer conceal its dead (Isaiah 26:21). People who died as saved individuals will experience the resurrection of their bodies and immediately leave this world to forever be with the Lord. Those who died unsaved will be raised up as well, but only to have their lifeless bodies scattered about the face of all the earth. Death will be everywhere. works that are therein shall be burned up. I say unto thee, To day shalt thou be with me in paradise. in white robes? and whence came they? And I said unto him, Sir, thou knowest. will turn and repent, and turn away from his fierce anger, that we perish not? to go to God and beseech Him for His great mercy. Yeah. What he said. If Judgement Day is tomorrow, I don't think I'm going to be posting any longer. I'll be too busy being tormented. Or looting, depending on how one interprets the Book Of Revelation. On the upside, I think God will probably End The Fed. The twisting of scripture on that site makes me cringe. "If all of you readers are taken up into the sky, and I'm left behind to take care of the dachshunds, I'm going to spend my free time improving my HTML skills." Hell, I'd rather stay down here, myself, and take care (create a glorious army) of wiener dogs. Do we get to wear a suit on Judgment Day, or will they issue us an orange jumpsuit? The big question is "what happens to their pets"? Fortunately, athieists have it covered. 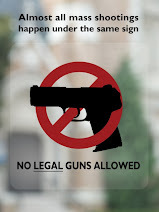 Then there's the question of Christians being allowed to have jobs where they are responisible for the safety of others. Do you really want to to be operated on by a "real Christian" if there is a risk of him/her vanishing in mid-operation?